AN INSIGNIFICANT MAN is a political documentary charting the transformation of Indian populist socialist activist Arvind Kejriwal from campaigner to mayor of India's capital city, Delhi. It takes us inside the cramped offices where Kejriwal forms a grass-roots campaigning organisation from scratch, staffed by idealist young men (rarely women) who have quit good jobs, inspired by his anti-corruption stance. At first, it doesn't appear as if he has a platform aside from lobbying for anti-corruption law, but he soon alights upon a manifesto of giving poor citizens free water and heavily subsidised electricity as vote-winners. In doing so, he is helped by his fellow party founder Yogendra Yadav. Together, the party they form unseats the incumbent politician and as we leave Kejriwal he is basking in the glory of his people. We learn in a triumphant final subtitle that he has made good on his promise to deliver water and cheap fuel. The problem is that we also learn a lot more about Kejriwal in the end credit subtitles, and what we learn is far more fascinating and nuanced than the generally hagiographic linear documentary that has proceeded it. 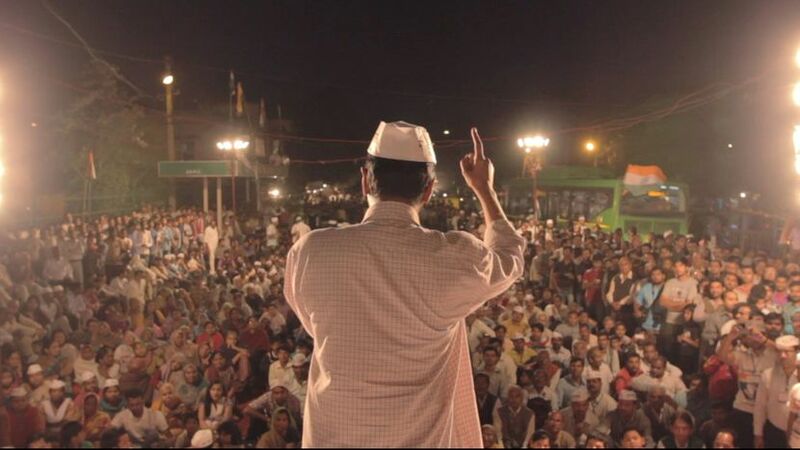 We find out that this so-called champion of the underdog stands accused of being dictatorial, that his co-founder Yadav has left him to form another party, and that Kejriwal resigned the Delhi post after a matter of months, causing massive dissatisfaction among his electorate, before returning to power a few years later. So we are left with a documentary where the more interesting personal story begins once the footage ends. And this is an even bigger problem because it would illuminate the central problem Kejriwal himself makes at the start of the political journey. As a political activist he resisted forming an actual political party because he thought India was so corrupt that there was no way to affect change using its rotten institutions. And so, if he eventually fell pray to that same corruption, this would be a fascinating story. Far more fascinating that this lukewarm hagiography, anyway. AN INSIGNIFICANT MAN has a running time of 96 minutes. The movie played Toronto 2016. There are still tickets available for the screening on Sunday 9th October at the BFI London Film Festival where it has been nominated for the Grierson Award.